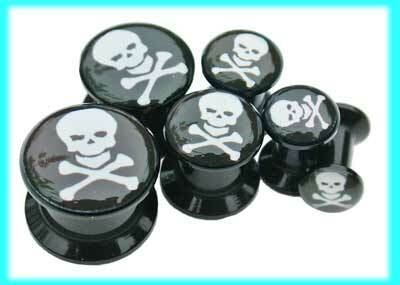 These black acrylic flesh plugs with a skull and crossbones design have one end which unscrews for fitting. These flesh plugs are available in a 4mm, 5mm, 6mm, 8mm, 10mm, 12mm, 14mm, 16mm, 18mm, 20mm, 22mm or 24mm size. The price is for one flesh plug. The best eCommerce software by ShopFactory powers P9243. All-in one eCommerce and shopping cart software.